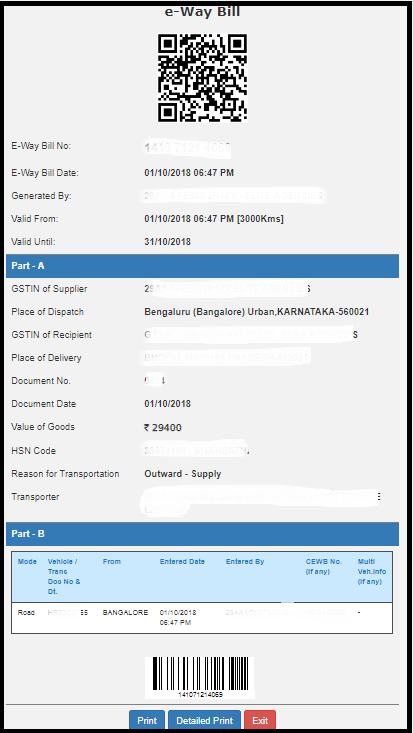 In this post, we will learn the e-way bill generation through Eway bill portal. E-way Bill is an electronic waybill for the movement of goods which can be generated on the Eway Bill Portal. Eway bill can be generated, extended or cancelled through the Eway bill website, SMS, and by Site-to-Site Integration (through API). When an Eway bill is generated a unique Eway bill number (EBN) is allocated and is available to the supplier, recipient, and the transporter. The Invoice / Bill / Challan related to the consignment of goods must be in hand. If transportation is by road, Transporter ID or the Vehicle number must be in hand with you. If transportation is by rail, air, or ship, Transporter ID, Transport document number, and date on the document must be in hand. Step-1: Visit Eway bill common portal website at ewaybillgst.gov.in/login and log in. 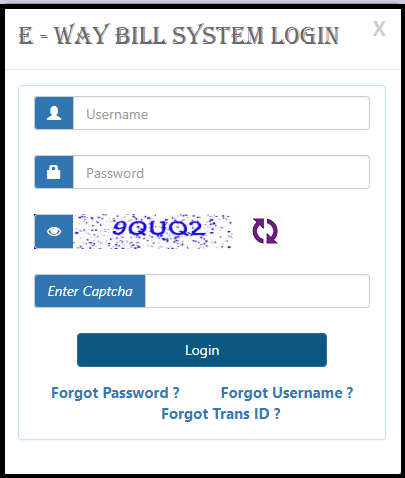 Step-2: You will be re-directed to the dashboard of your Eway bill portal login. Information regarding your recent process in the portal and other options will be available on this screen. Step-3: Different options required for Eway bill generation are listed as below. 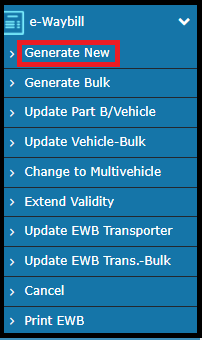 Step-4: To generate a new Eway bill, go to “e-Waybill -> “Generate New”. Transaction Type: Outward if you are the supplier and Inward if you are the recipient of the goods. Sub Type: Depending on the transaction type, the sub-type of the transaction will be displayed. Document Details: The information of the document being sent with the goods i.e., Document type, document no and document date. Note: You will not be allowed to enter the future date. Bill From & Bill To details: The details of the supplier and the recipient of the goods. Depending on the type of transaction, your details will be auto-filled in From / To section. Note: If the supplier/recipient is unregistered, then mention ‘URP’ in the field of GSTIN, which indicates that the supplier/recipient is an “Unregistered Person”. Item Details: Complete Details of the items that are being transported. 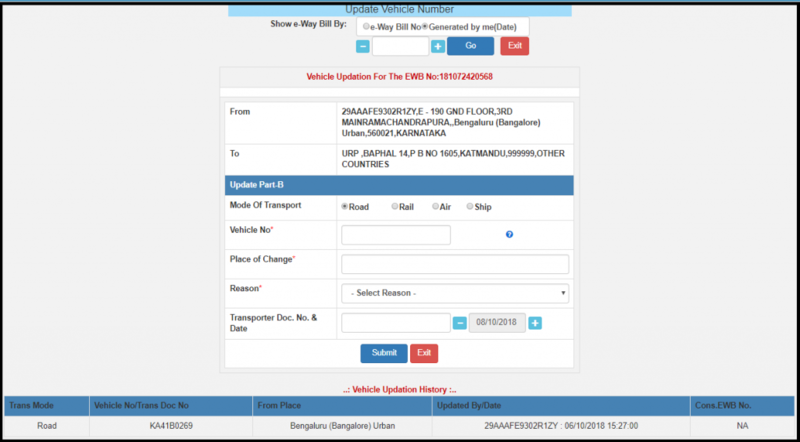 Transporter Details: The details of the transporter, transportation mode and the transporting vehicle details are given in this section. Step-1: Go to the e-way bill option on the left of the screen. Under this option, select Print EWB. Step-2: Enter the EWB No. which is required. The EWB will be displayed, which can be re-printed and used. Step-1: Go to the e-waybill option on the left of the screen. 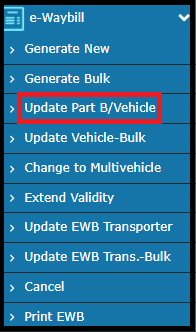 Under this option, select Update Part B / Vehicle. Step-2: Enter the EWB No. or the date of EWB generation. The EWB generated will be listed. 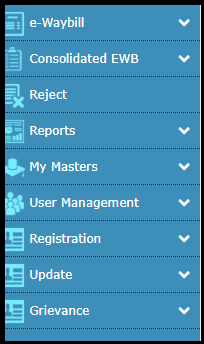 Step-3: Next, Select the relevant EWB, make the required changes and click on Submit. The changes will be updated. This ends the post on e-way bill generation from e-way bill portal. Saral – An Accounting and Billing software by Relyon Softech Ltd is a GST compliant, user-friendly software that covers all your accounting and billing needs. We cover everything from inventory to MIS reports so you can manage your business without worrying. #73, 2nd Floor, Shreelekha Complex, WOC Road Mahalaxmipuram , Bangalore-560086.